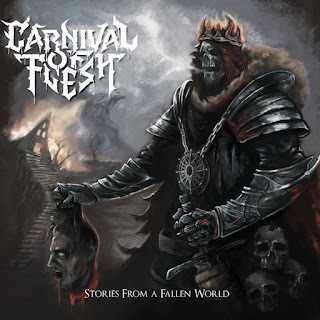 Carnival Of Flesh are a band from Serbia that plays a very symphonic form of black metal and this is a review of their self released 2015 album "Stories From A Fallen World". A heavy guitar riff starts off the album and mixes in with the symphonic elements that kick in a few seconds later along with some grim black metal screams and the vocals also use whispers at times along with a small amount of clean singing being used in some parts of the songs and the riffs also use a decent amount of melody. All of the musical instruments on the recording have a very powerful sound to them and when the music speeds up a bit a small amount of blast beats are utilized and some songs also bring in a small amount of spoken word parts and the songs also bring in a great mixture of slow, mid paced and fast parts and when guitar leads are utilized they remain true to a melodic musical direction and as the album progresses a brief use of death metal growls can be heard and there is also a track that is very long and epic in length. Carnival Of Flesh plays a style of black metal that is very symphonic and is more closer to the mid 90's era of this genre, the production sounds very professional for being a self released recording while the lyrics cover pain, misery, death and suffering. In my opinion Carnival Of Flesh are a very great sounding symphonic black metal band and if you are a fan of this musical genre, you should check out this album. RECOMMENDED TRACKS INCLUDE "The Promise" and "The Battle". 8 out of 10.